Another view of the storage jars. 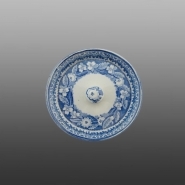 View of the two patterns printed on the lid and the interior rim of the jars. 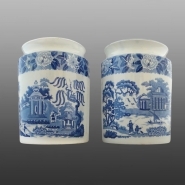 A pair of earthenware storage jars with covers printed in blue each with two patterns to which the TCC has assigned names: On one side is the Chinese River Scene with Temple and Pyramids. Printed on the other side is a second pattern, Willow and Summer House. The outer border is of a floral design including the passion flower and the interior border is made up of a linear series of half flowers. The jar cover is decorated with a Heartsease and Primrose border found with a different pattern named Boy Piping. A workman's mark, not yet identified, is found on each. Possibly made by the Cambrian Pottery but not confirmed.